Tokai – Lower Compton, Plymouth, Devon. Tokai is in Lower Compton, Plymouth. 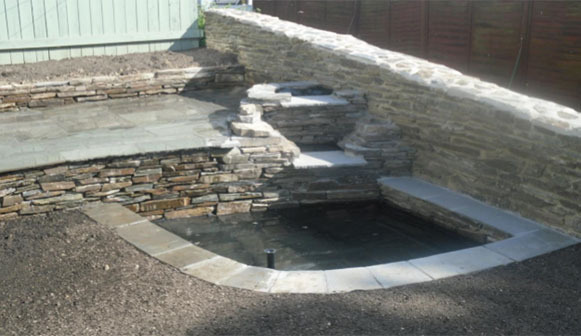 The rear garden consisted of a redundant fish pond, unsightly crazy paving, walls on the point of falling down, uneven steps and overgrown weeds and vegetation where once a lawn existed. 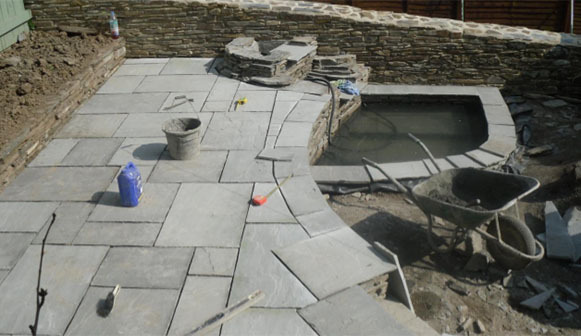 The client wanted the whole garden re-landscaped to a similar design to what was there already and one of the first things we did was to rip up the old crazy paving and demolish any walls to give us a supply of stone for building the new walls. 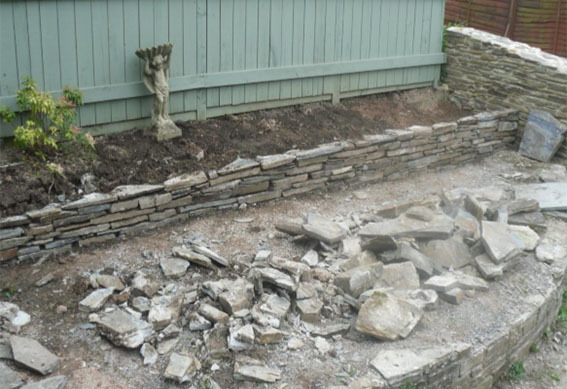 The first wall we constructed was a small dwarf drystone wall to form a raised planter against the existing fence boundary. 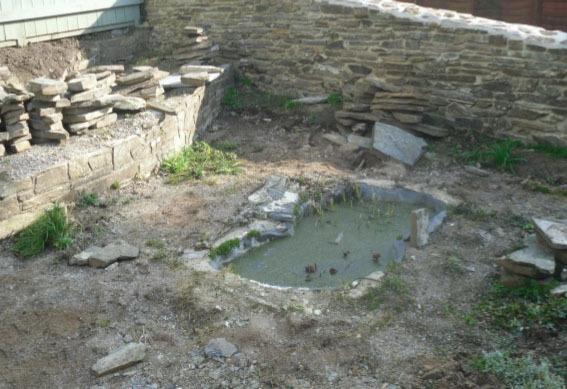 We then dug out a hole in the ground roughly in the same position as the original pond, but extended it further so it backed onto the existing stone boundary wall. 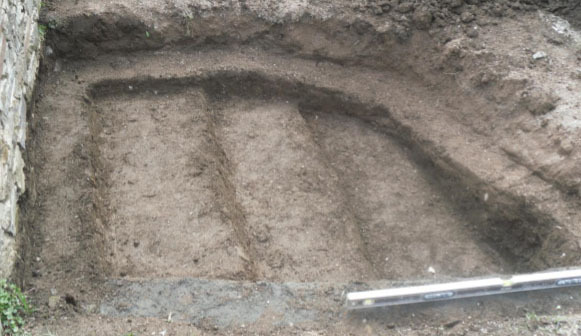 The excavated hole stepped down over three levels. 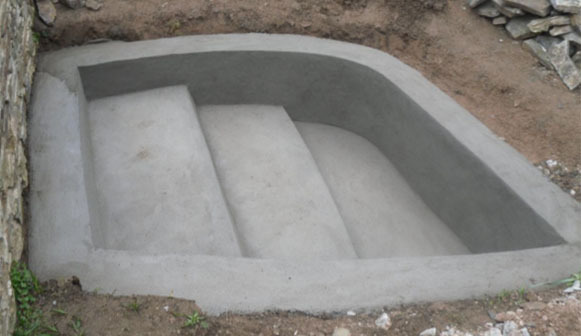 This was then shaped out with a concrete screed to form the base with brick rendered walls to strengthen the sides for the final shape of the new pond. 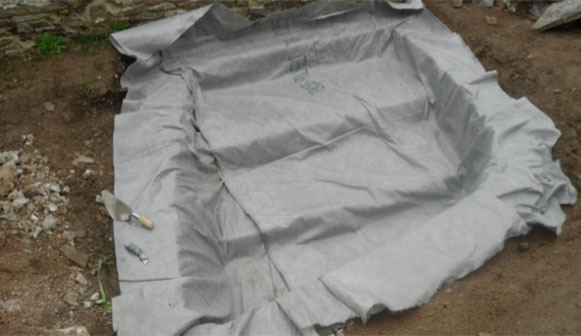 Once this had time to dry out a protective fibre matting was laid in. 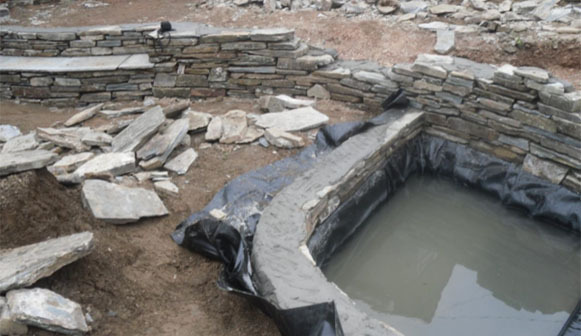 This was to protect the heavy duty pond liner which went in next, and once this was in position it was part filled with water and stonework was built on top around the edges to keep it in place. 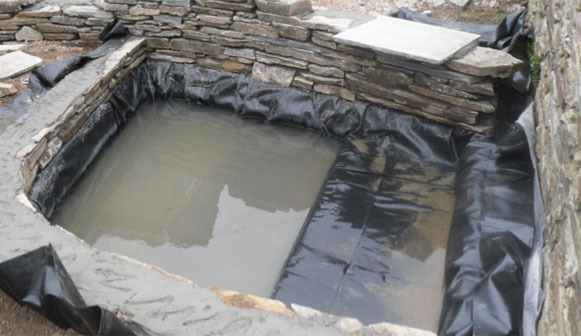 The wall on one side of the pond also formed a retaining wall to retain the ground level behind it as the garden was set out over two levels and conduits were laid in just under the final water level to take electric cabling for pumps and lights. 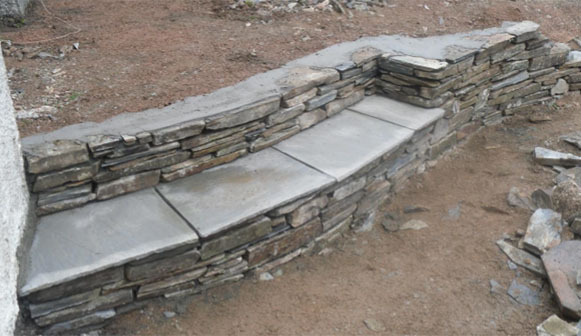 This wall included steps leading down to the lower level. 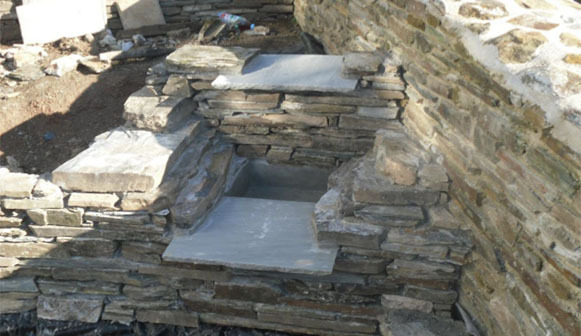 And a waterfall feature that would eventually cascade down into the new pond. 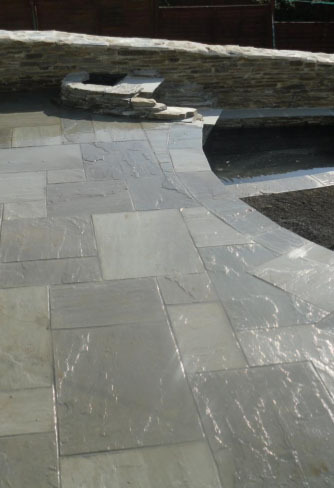 Once all the stone walls, steps and waterfall feature were complete, the upper area was then paved using a grey Indian sandstone that was laid in a random pattern. 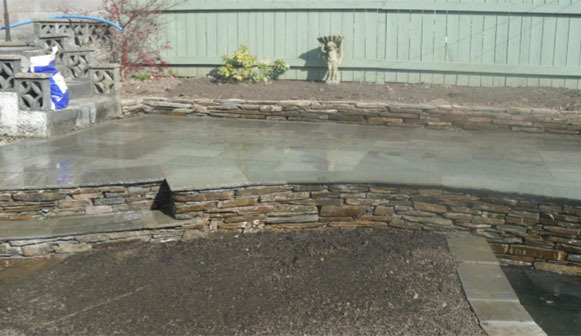 The sandstone was also used to form an edge around the pond. 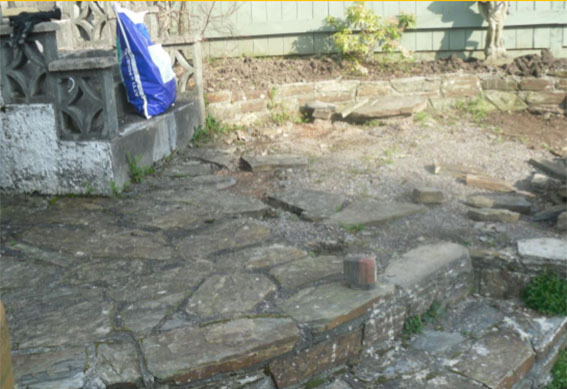 Old railway sleepers were put into place to create a small retaining wall between the new lawn area and a sloping path. 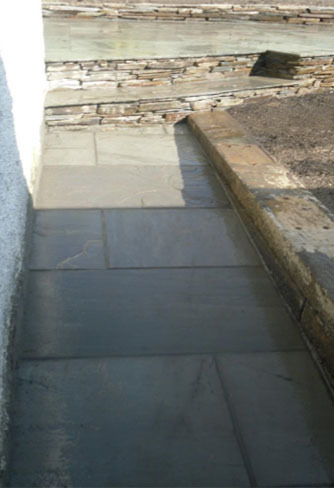 This path led from the rear entrance into the garden up to the new steps and was then paved using the same Indian sandstone. 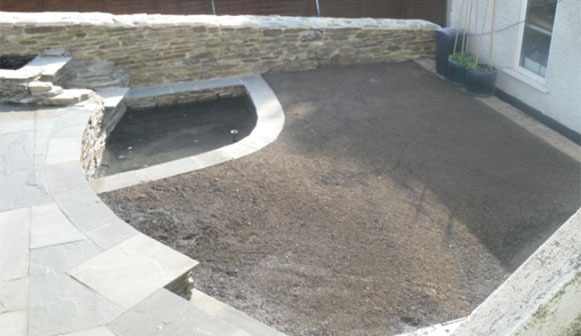 The area for the new lawn was levelled out with topsoil in preparation for the new turf.